Sooo...Daddy broke a Belly Rule: wakin' me up on a lazy Saturday morning. Usually I go to my granma's house to visit, but she's dog-sitting, so I stayed home with my Daddy. And Daddy, who rarely moves on a Saturday morning, decided that we needed some sun and exercise. 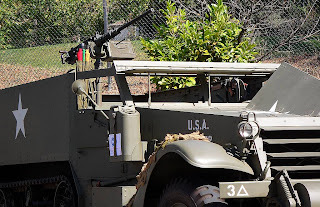 My adventure harness was attached, and we climbed into his Mantruck and we drove to Orinda, where a big car show was going on. I wondered why, and Daddy said that his Daddy and Brother (I guess my Granpa and Uncle?) where going to be there. When we parked, Daddy spotted trouble: A farmer's market...where no dogs and pugs are allowed? And it was blocking our way! Oh no! ?, So what did we do...we broke the rules, and sneaked through the market. Luckily, the farmer's market police didn't see us! Stealth-Belly strikes, again! We met with the peeps, and walked around looking at all the hooman stuff. I gotta admit, I wasn't too thrilled aboot the hooman stuff, but there were a lot of nice people there, and lots of other doggies to sniff and hang out with. We took a break next to Daddy's brother's "hot rod." I bet it could take me to all the pug events sooper fast. 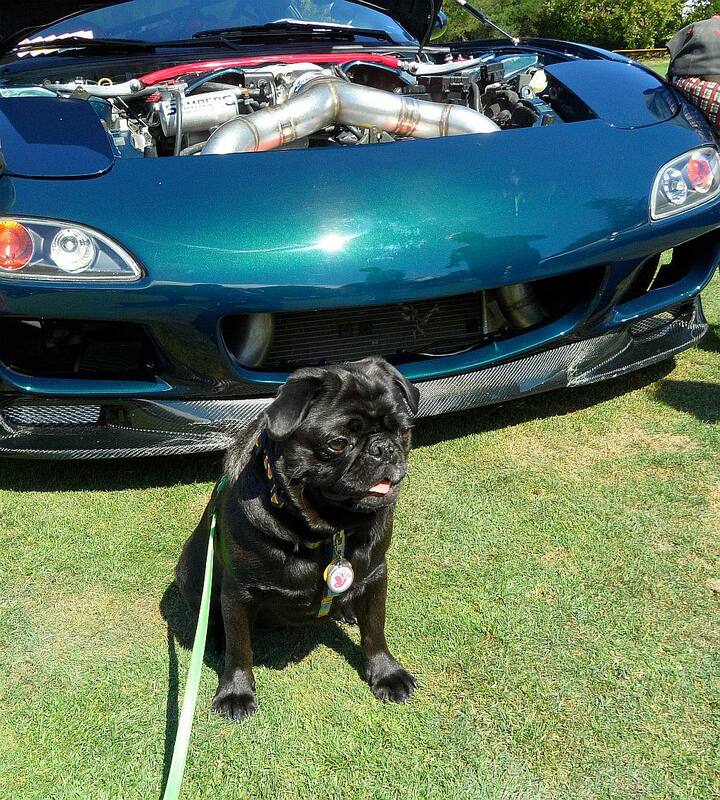 But, then again, Mommy drives sooper fast, and would probably beat the hot rod in her pug-mobile. What a fun day you had with your daddy! I bet you'd figure out how to drive that thing, Bella! Don't let that stop you and your diabolical plans! Hehee! All you need is a couple more pugs to help you with the pedal thingys on the bottom, you could steer, one pug in the back on rear watch and another to man or should we say "pug" the gun on top. Let us know when you want to launch your operation, then you can bring your rig over to our house and we'll get the birds that attack us everyday. Way to go Bellatrix - you solved the equation! What a great day with Daddy!, Off course you can drive a Tank, your super Bella!!! go get that cat!!! Polka Dog Yummy....get in my belly!! Busy as a bee Belly!